Reclining listlessly on her yacht, Elsa Bannister, urged by her eager, voyeuristic husband Arthur and his vulgar crony Grisby, sings “Please Don’t Kiss Me,” a tired, broken hearted elegy. It is here and now that her lover, Michael O’Hara, realizes the depth of his feeling, the acuteness of her longing and the ominous current which is dragging them all under. This scene was never supposed to exist. Panicked that a Rita Hayworth film without a musical number would sink at the box office, producer Harry Cohn ate $60,000 of his own money and ordered Orson Welles to shoot it. 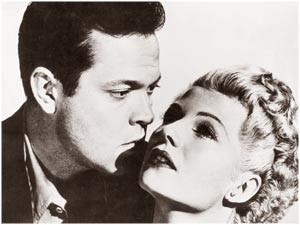 As it turns out, it’s impossible to imagine The Lady from Shanghai without it. The scene begins with the camera lingering over Hayworth’s body, as if it were a lover bearing down on her, uncomfortably forced to heed the title of the song. The allure of her vacant expression feeds an unconsummated tension. If ever the limitations of the cinema were apparent, it’s here. Somehow Welles, only Welles, makes this tormenting restriction of the medium a key element of the drama. Of course Arthur Bannister, crooked of body and mind, could never satisfy a woman like Elsa. He, too, hangs over her—looking, but not touching. Don’t take your arms away. And who knows when the rain will start? Bathed in shadow, O’Hara watches her entertain the sweaty boredom of Arthur and Grisby. So beguiling is Hayworth’s performance that her mouth eventually seems the very center of the universe. Like a siren’s call, it’s what will send O’Hara crashing to the rocks. How ironic: on a yacht, all ostensibly drifting in the same direction, and yet each character trying to drag the other their own way. While quite beautiful, there’s also something deathly in Elsa’s delivery. She lays still, as if on a slab, disturbed only by the cigarette she brings to her lips. Her movements seem unnaturally premeditated, hinting at the fate—the unerring heartbeat of noir—which will befall her. Her delivery is the antithesis of Gilda’s ebullient “Put the Blame on Mame.” Here she seems to have withdrawn so far into herself that the revelation of her murderous greed later on comes as no real surprise. The slow, mournful song comes to an end with Elsa mouthing “away,” the lingering lover leaving her mouth unkissed. Elsa closes her eyes, turning away before the slow fade out, as Welles ends the scene with the same deathly imagery with which it began. It’s possibly the finest concession to an anxious studio ever made.